Vodacom is committed to the highest standards of business integrity, ethics and professionalism. Vodacom has a unitary Board of 12 directors. Five directors, including the Chairman, are independent non-executive directors. Five are non-executive directors and two are executive directors. 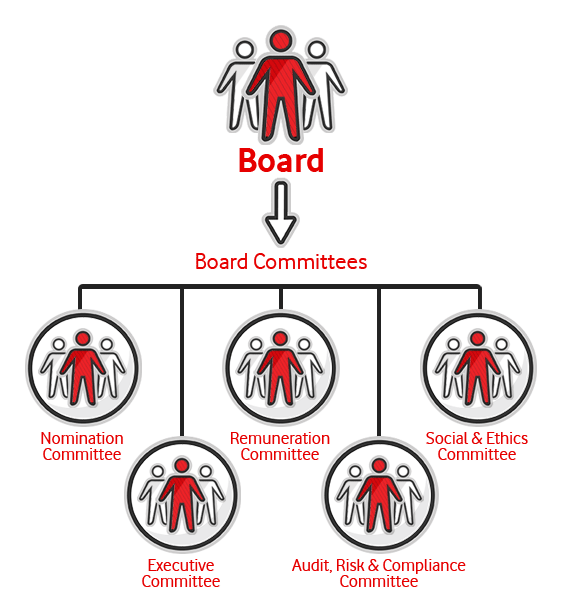 Although the majority are non-executive directors, half of our non-executive directors are not independent as recommended by King IV as they represent Vodafone. The application of King IV is on an apply and explain basis and while the effective date for disclosure on the application of King IV is only in respect of financial years starting on or after 1 April 2017, the practices underpinning the principles so espoused in King IV are entrenched in many of the Group’s internal controls, policies and procedures governing corporate conduct. From a materiality point of view, the Board is satisfied that in the main, Vodacom has applied the principles so set out in King IV. Download Corporate Governance statement http://vodacom-reports.co.za/integrated-reports/ir-2018/pdf/additional-docs/corporate-governance-statement.pdf. The Vodacom Code of Conduct clearly outlines Vodacom’s zero tolerance to any form of bribery. Our Anti-Bribery policy sets out examples of conduct that could amount to an offence under Anti-Bribery Laws. Download Anti-Bribery policy. Vodacom is committed to ensure internationally acceptable human rights standards in its employment practices at all of its operations across the globe. Download our Declaration on Human Rights at Work Guide. The Board takes overall responsibility for Vodacom’s success. Its role is to exercise leadership and sound judgement in directing Vodacom to achieve sustainable growth and act in the best interests of all our stakeholders.